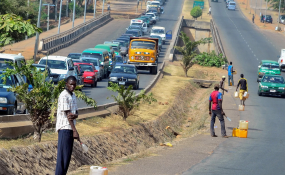 Following the unending queues for fuel in the country for the past three months, the Peoples Democratic Party, PDP, has called on President Muhammadu Buhari to quit his role as minister of petroleum resources and allow a "more competent hand to manage its affairs." The party in a statement on Sunday signed by its national publicity secretary, Kola Ologbodiyan, described "as unpardonable, the failure of the Buhari Presidency to resolve its inflicted unabated fuel crisis, which has brought untold hardship to Nigerians." The president has held the position of petroleum minister since the begining of his administration, only naming Ibe Kachikwu as minster of state for petroleum. Last year, human rights lawyer, Femi Falana, and some prominent Nigerians had equally asked President Buhari to quit as petroleum minister. The PDP asked the president to heed to the wise counsel from well-meaning Nigerians and quit his position as minister. It also scored the president low on economy. "It is disheartening that instead of being remorseful for its failures, the All Progressives Congress, APC-controlled Federal Government is busy dishing out lies and fabricated indices in an attempt to give Nigerians false hope on issues related to the fuel crisis and the collapsing national economy. "If the President Buhari had heeded wise counsel from well-meaning Nigerians, since last year, to quit office as the minister of Petroleum and allow a more competent and knowledgeable person to run the ministry, the situation would not have degenerated to excruciating pains Nigerians suffer today," it said. The party said Nigerians can no longer be held ransom over the perennial fuel crisis. "The fact that there are inherent poor coordination, inefficiency and reported heavy sleazes in a sector that is under the direct supervision of the President, raises a lot of issues and speaks volumes of the evident mismanagement of the system for which the economy is now in complete shambles. "Rather, the sector has been delivered to an APC cabal, whose mission, particularly, the desperate re-election bid, largely account for the biting fuel situation and the economic misery Nigerians suffer today. "It is instructive to state that the Presidency has refused to offer any explanation on the allegations linking the fuel crisis to the exposed siphoning of billions of naira through shady oil subsidy deals and the illegal lifting of crude oil worth trillions of naira, ostensibly to service APC interests ahead of the 2019 general elections."